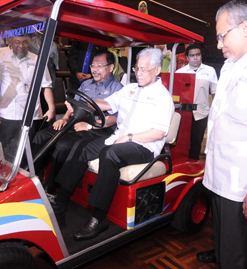 BANGI, 4 December 2014 – Malaysia’s first indigenous Hydrogen Fuel Cell vehicle was launched by Education Minister II Datuk Seri Idris Jusoh at The National University of Malaysia (UKM) here today. The engine was designed and produced by a team of researchers of the Fuel Cell Process System Engineering Group led by Fuel Cell’s Former Founding Director and Principal Research Fellow Professor Ir Datuk Dr Wan Ramli Wan Daud. The electrical power is produced by a stack of fuel cells generated by electrochemical reaction between hydrogen and oxygen from the air at low temperatures that produces water as a by-product. Fuel cell vehicles thus have zero emission and are clean, green, environmentally friendly and sustainable. Prof Wan Ramli said the buggy’s motor has a higher energy efficiency than conventional car engines at 50% compared to 30% for the conventional engine. It is small, easy to manufacture and weighs only 25% of the weight of the replaced battery using just 75% the space. UKM was given the mandate by the Education Ministry to lead the project to develop a zero emission vehicle using indigenous fuel cells with a grant of RM7 million for 3 years. Datuk Seri Idris took a test drive with UKM Vice-Chancellor Prof Datuk Dr Noor Azlan Ghazali in the cart. The launch was part of the 5th series of media conference and exhibition on the achievements and success of Malaysia’s research universities hosted this time by UKM. Director of Higher Education Prof Dato’ Dr Asma binti Ismail and UKM Deputy Vice-Chancellor (Research and Innovation Affairs) Prof Dato’ Dr Mazlin Mokhtar witnessed the launch. Prof Wan Ramli said leading car makers like Toyota, Honda, Nissan, Ford, Renault and GM will be rolling out commercial fuel cell vehicles in 2015 in markets that already have hydrogen supply infrastructure such as Japan and Germany and other European and American cities including Los Angeles. He expects a fuel cell car prototype will be built by 2016 with the cooperation of other Malaysian universities and Malaysian automotive companies. Prof Wan Ramli thanked the new Director of Fuel Cell Institute UKM, Prof Dr Abu Bakar Muhamad, Deputy Director, Prof Dr Siti Kartom Kamarudin, Assoc Prof Dr Edy Harianto Majlan, Director of UKM’s Centre for Research and Instrumentation (CRIM) Prof Dr Mohd Fauzi Zain as well as fellows and staff of the Institute and CRIM for their help in launching the vehicle.